On December 12, Dawn Fournier, Neches FCU AVP of Business Development, presented Ivy Pate, CHRISTUS Southeast Texas Foundation President, and Melissa Conley, Children’s Miracle Network Hospitals Program Manager, with a check for over $5,000 at St. Elizabeth’s Pediatric Center. 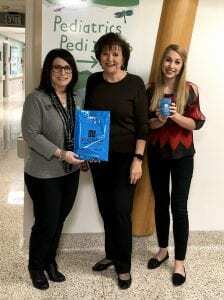 Throughout the year, Neches Federal Credit Union employees hosted several fundraisers benefiting local kids through Children’s Miracle Network (CMN) Hospitals. Their donation of over $5,000 was raised through bake sales, Miracle Jeans Day (a day where employees can make a donation to wear jeans to work), and other fundraisers. 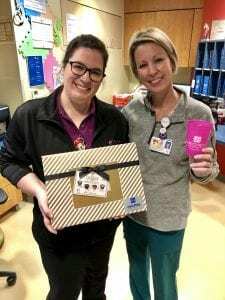 In addition to presenting their annual donation, Dawn brought a gift of chocolates for the pediatric nurses and goody bags for St. Elizabeth’s pediatric patients. Each goody bag came with a Neches FCU cup, activity book, crayons, stickers and plenty more to keep kids entertained while in the hospital. Neches Federal Credit Union is part of the Credit Unions for Kids movement and a proud partner with Children’s Miracle Network Hospitals. Thank you to the employees and members of Neches Federal Credit Union for your continuous support of local kids in the hospital!